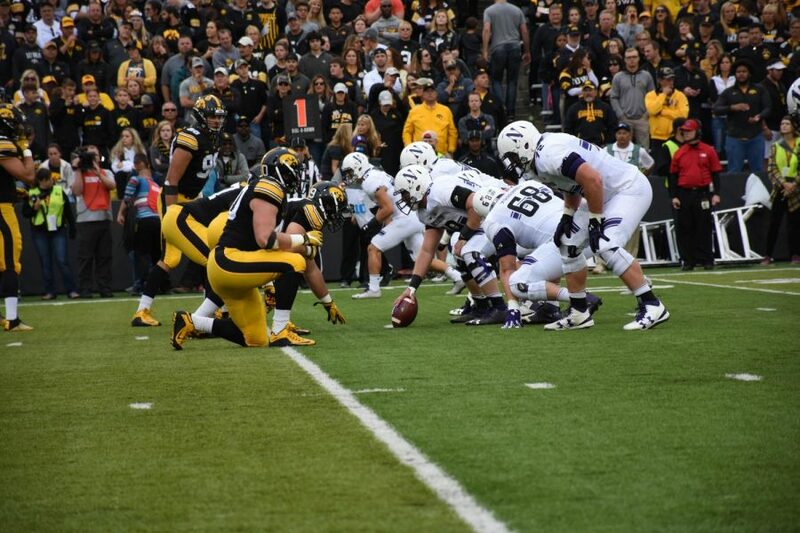 Northwestern's offensive line prepares for a snap in last year's game against Iowa. Jared Thomas has helped stabilize what Pat Fitzgerald has called a "fluid" unit. KENOSHA, Wis. — A week ago, near the outset of fall camp, coach Pat Fitzgerald said Jared Thomas was given an opportunity. Thomas, it seems, has made good use of that opportunity. The sophomore offensive lineman continued to run exclusively with the first team at left tackle here on Wednesday, an eye-catching display of stability on a line that has seen a plethora of players rotate through positions. Asked last Wednesday about Thomas running with the starters, Fitzgerald said only that the line was “fluid.” The 6-foot-4, 285-pound Thomas, however, has taken the overwhelming majority of snaps at left tackle in three camp practices attended by The Daily. Still, Thomas said he was taking nothing for granted. Thomas’ insertion into the rotation as a starting tackle was a surprise. Though Fitzgerald shared his frustration with the play of his tackles last year at Big Ten Media Days, Thomas was not thought to be among the contenders to compete against junior tackle Blake Hance, who started all 13 games last year. Thomas worked his way onto the depth chart last year as a backup interior lineman, starting one game at center. He does not have game experience at tackle. Thomas made himself known during a running drill late in Wednesday’s practice, barking out specifics to offensive and defensive linemen as to how they should complete the drill. Like he did about his play, however, the understated Thomas demurred about his leadership role. Redshirt freshman defensive tackle Jake Saunders suffered a season-ending injury in practice in the last several days, an athletic department spokesman and Fitzgerald confirmed. Saunders was not likely to be a major factor this season, but was expected to compete for a reserve role on an interior defensive line led by senior Tyler Lancaster and junior Jordan Thompson. A three-star recruit from Ohio, Saunders earned a defensive practice player of the week award in his redshirt season. His size — 6-foot-2, 295 pounds — may be among his best assets. “He’ll be back, and he’ll be back with a vengeance,” Fitzgerald said. Saunders joins wide receiver Solomon Vault as the only NU players certain to miss the entire season, though cornerback Trae Williams is expected to miss several games, at minimum, and defensive end Xavier Washington remains suspended following a drug-related arrest in the spring. A number of Cats stalwarts did not participate in Wednesday’s practice, instead taking part in side conditioning drills with players returning from injuries. Fitzgerald later explained that many players, including Lancaster and senior safety Godwin Igwebuike, were using a “Veterans Day,” a day off from practice a player earns for accruing 12 career starts. Those who did partake in full practice faced a challenging, fast-paced day complete with a heavy dose of scrimmage situations. Though some players sat out, others have returned to being full participants. Chief among them are wide receivers Flynn Nagel, who sat out most of the first week of camp (though not for injury reasons, the spokesman said), and Macan Wilson.